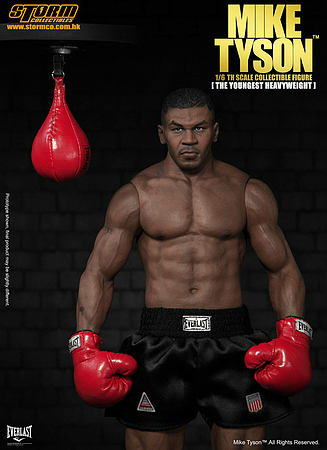 Storm Collectibles proudly present the official Mike Tyson 1:6th Collectible Figure set, imaged Tyson’s amazing young boxing career on the ring and his training scene. The tailor-sculpted head, body and tattoo are highly-detail crafted based on Mike Tyson’s earliest professional boxing era at the 80's. Featuring with official licensed Everlast boxing gloves, trunk and training equipment. 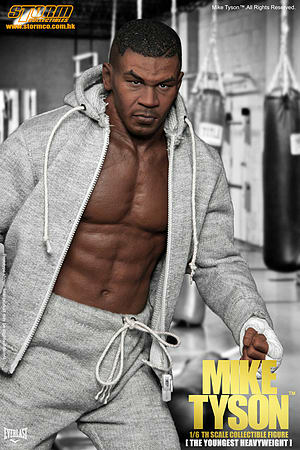 Mike Tyson, a former undisputed heavyweight champion of the world and holds the record as the youngest boxer to win the WBC, WBA, and IBF heavyweight titles at the age of 20. Tyson won his first 19 professional bouts by knockout and 12 of them in the first round! - Authentic and detailed fully realized likeness of Mike Tyson in his earliest boxer career in late 80's.